Mozilla has just released the Firefox 6 beta for download. Firefox 6 beta is now officially available for Windows, Mac, Linux and Android users. Firefox 6 beta is released just few days after the release of Firefox 5. This release introduces innovative tools to help developers build rich and compelling Web experiences. Looks like Firefox team is working hard these days. Firefox 5, which was scheduled for 21st this month, is released before its release date. Yes, Firefox 5 is released 3 days before its release date and is available for download via FTP. Here is a cool firefox addon for cricket lovers – HitWicket. 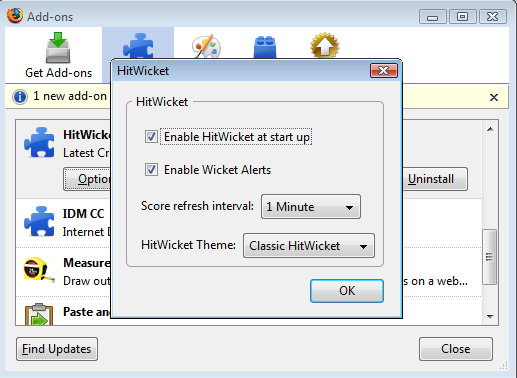 HitWicket displays live cricket score in the status bar of Firefox. It is based on the ScoreWatch Firefox extension and it shows cricket score updates from CMDN.com in the status bar. To find the font used on a particular text on any webpage, a user needs to view the source code of the page. It may be easy task for webmasters but for normal internet users this method is very complex. Today I will share a Firefox add-on that simplify this task and let you view the font used by right-click only. If a nofollow tag is added to a link, it will prevent search engines like Google, Yahoo, MSN from indexing that link. So after exchanging your blog’s link with other blogs, you must check for nofollow tag. You must only exchange link with other bloggers if they are giving you a dofollow backlink otherwise there is no benefit of exchanging link with others. Right click anywhere in your Firefox browser and select View Page Source ( Or simply press Ctrl + U ). Now in source window, press Ctrl + F and search for ‘nofollow’ . If you can not find nofollow tag, it means that the blog is a dofollow blog . SkipScreen is a very useful and handy Firefox add-on for downloaders. It skips unnecessary pages on sites like Rapidshare, Megaupload, zShare, Mediafire, and more. Do you spend a lot of time searching for some good sites to watch online TV? then here is a good new for you. You can watch TV directly from your Firefox browser without leaving your work. TV-FOX is a Firefox add-on that allows you to watch TV directly from your Firefox browser and that is for FREE. TV-FOX offers you 2780 Live TV Channels.